Altitude sickness is range of related conditions that can affect you when riding on a plane as well as hiking up a mountain. Living in high altitudes can cause you to get sick, too. Altitude decompression sickness causes achy joints and pain among other symptoms. Altitude sickness is treatable; consult your physician immediately if you are experiencing a severe form of altitude sickness. Altitude decompression sickness is a type of altitude sickness that affects climbers, scuba divers and people who ride in unpressurized aircraft. The condition causes joint pain as well as respiratory and neurological symptoms. Most people generally can ascend to 5,000 to 6,500 feet without experiencing symptoms from the change in atmospheric pressure. Around 20 percent of people who go to 8,000 feet and 40 percent who ascend to 10,000 feet have altitude problems. How fast and high you go, how hard you exercise and what altitude you sleep at influence your chances of developing problems. The bends is a type of altitude decompression sickness. Tiny bubbles appear on the body, mainly around your ankles, knees, hips, wrists, elbows and shoulders. The bubbles are from a reaction to the change in air pressure. Low air pressure causes inert gases that normally dissolve in bodily fluids to instead bubble out; this is similar to opening a carbonated beverage. The bends may cause you to feel a deep pain in a joint or a dull ache at high altitudes, while descending or even up to several hours afterward. Any joint movement generally increases pain. Decompression altitude sickness may cause neurological symptoms, with headaches being one of the most common. Headaches may be more than a neurological problem, though; the cranial sutures in your skull are joints, and decompression sickness mainly affects the joints. Headaches may actually be joint pain. 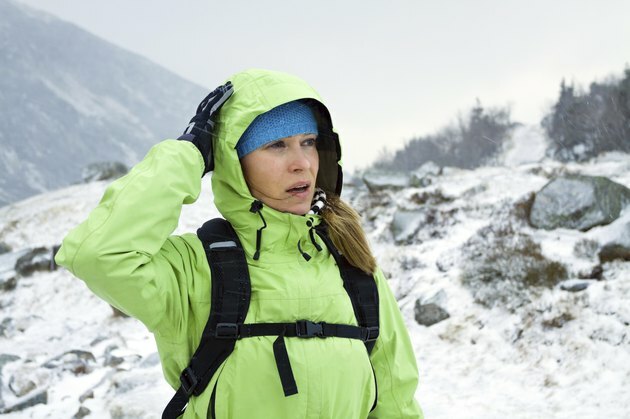 Decompression altitude sickness can cause weakness or paralysis in the feet that moves up the body. It also can lead to chest pain, abdominal pain and unpleasant sensations in your back and lower chest, including stinging, burning and tingling. Another type of altitude sickness that can cause joint ache is chronic mountain sickness, or Monge's disease. If you live somewhere with a high altitude and have been there for a long time, you may develop this disorder. Symptoms include aches and pains, fatigue, shortness of breath, a bluish skin coloration and sometimes deep venous thrombosis, or formation of a blood clot in a deep vein. Descend to a lower altitude if you experience these symptoms and consult a doctor. Recovering from chronic mountain sickness usually is slow and may happen again if you go back to high altitudes. Why Do I Get Tired Faster in High Altitudes?